The initial contact is the beginning of a trust and empathy building process. While most of our clients prefer to keep appointment-setting within their own control, some are so frustrated with their prior efforts that they are willing to cede this important function to an outsourcer. With the ability to share database information, outsourcers have much of the information required to solve your clients’ needs. Still it is frustrating to your callers when an agent is unable to answer simple questions without pausing (often placing your clients on hold) to search a database. Even after such delays, an outsource agent is often unable to answer simple questions regarding amenities, services, location, neighborhood, or other factors that someone personally familiar with your business would readily know. At Call Center Today, many of our clients feel that they get more consistent results from their own people than from an ever-changing pool of reps at an outsource contact center. 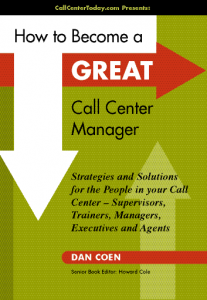 However high your own employee turnover, the typical outsource call center’s is much higher. Of course, your own contact center can also frustrate callers. How many of calls go to voicemail? How many go altogether unanswered? More training and better quality control can solve many internal issues. Designation of a few of your best appointment-setters as representatives of your distributed call center can solve the problems of local knowledge and quick response. Outsourcing can free up supervisory and employee time and reduce the attention and training you would normally invest in developing the skills of your own people. If your team has not produced good results under your management, it might make sense for you to outsource. But, consider whether it is advisable for you to give up these core skill sets and depend, entirely, on another company’s employees to handle your leads. Finally, study your outsource contract carefully. 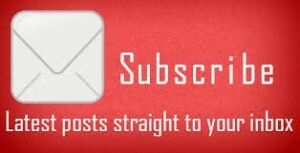 Minimum or maximum monthly fee might help or hurt you. With proper training and supervision, in-sourced contact center reps can provide efficient and effective response to varying call levels. Because they are your employees, you can reassign them to other roles as needed. Reps who handle inbound calls can also make outbound calls. It may surprise you to learn that even an outsource call center misses calls. Sometimes, many calls. Which is more expensive to start up? While outsource contact centers face the same startup investments that you would (all of which they pass along to you), hiring an outsourcer allows you to defer an upfront investment in favor of a monthly expense. The outsourcers control capital expenses and labor costs. If they are efficient, they might actually save you money. If they are inefficient (or greedy), they will certainly cost you money. If an outsourcer operates out of a fancy facility, it may make for a great brochure, but you can be sure that clients like you will ultimately pay for their image. Bottom line: If you do outsource, you need to carefully choose the provider. Building your own physical contact center can be expensive in the short term (with labor, facilities, furniture, hardware and software) but can have some great long-term financial benefits. If you plan on operating your facility for ten years or longer, it could be a good investment. The depreciation looks good on your P&L, plus there may be some government incentives. The main considerations are: how much capacity do you need, and what financial benefits will you gain. Is there such a thing as a cost-free contact center? Almost. In many cases, the least-expensive alternative is a “distributed” or “virtual” contact center. You may already have a PBX system that supports inter-office call routing. If not, there are inexpensive, hosted services that can deliver calls to your own, select employees, even if they are located in different offices or different cities. If you already use a service like CallSource for your call tracking and recording, the virtual contact center may, indeed, be free, in the sense that you can create one without hiring additional employees or acquiring additional workspace, computer or telephone systems. Which is more expensive to operate? Here, we are really talking about labor costs, which include more than just hourly wages and productivity incentives. It also includes taxes, health benefits, retirement plans, paid time off, and costs associated with each employee. And there are other indirect costs like human resource managers, trainers, supervisors, and the stress of bringing a new group into your culture. Outsourcers face the same costs you do. Again, they will pass those costs on to you, plus charge a premium so that they can make a profit. You might expect that utilizing an outsource team would be less expensive than creating and maintaining your own contact center team. But, when you also consider results, it may not be true. No-one, not even a great outsource contact center, cares as much about your business as you do. With great quality assurance, and consistent and ongoing training, your in-house reps can actually outperform almost any outsourced rep. Your own people bring consistency, loyalty, and caring that can make a difference on each and every call. As we have discussed, utilizing your own employees in a “virtual” contact center may be virtually cost free. You direct all incoming contacts to people you already employ, specifically, those who are your most effective appointment setters. While responding to customer contacts is their number one priority, when they are not busy setting appointments, they can perform other duties for you. All they need is excellent training, proper incentive, and ongoing performance review. Your existing PBX or call routing service won’t add any new expenses, either. Make Necessary Changes To Compensation. Creating a new call center compensation agreement involves creating change. From one plan to the next, agents must change their mindset and personal goals to meet new objectives. Because change is considered by many to be unfriendly anyhow, change involving the way one gets paid accentuates agents’ concerns. If the compensation plan penalizes agents in comparison to what they had before, they feel this is retribution, and turmoil ensues. They want to know why the plan has penalized them. They want to know why they should continue to perform at the same level, or even a higher level, when they are being paid less. They want to know how management developed this new plan, and during what timeline management may change it again. The truth is that management almost never changes compensation plans to give their agents more money. They may change a plan because goals have changed. Or they may change a plan to reduce the level of income attainable. But agents and management recognize that changing compensation plans always has some sort of “dent” involved. It may be a change in policy or a change in payment, or a reduction in money or a change in payable terms, etc. When management makes changes, it is nearly always not to the benefit of their agents. Change The Measurements, If Needed. Instead, a change in measurements is what gets the most attention. If the change in measurements clearly is one that the agents feel negatively impacts them, then agents begin asking questions to themselves and their supervisor. Why are you not paying us for something you used to pay us for? Why are you paying us for areas that are out of our control? Why are you changing the requirements for pay? Why do you feel a need to change measurements? Building Retention Through Compensation – Recap! 1. It can be an emotional, but sometimes essential, task to create new pay agreements. 2. Compensation plans can create success or failure for a call center. 3. Take your agents into consideration when creating a new plan. 4. First and foremost, consider the best plan as a whole, which will keep profits coming. 5. New compensation plans must motivate agents to do well or the company suffers. 6. Do not pay above budget or jeopardize your bottom line with a new agreement. 7. Make sure agents do not feel you are “penalizing” them with the changes. 8. Properly explain how and why things must change, without causing fear. 9. Beware of changes in measurements that may leave agents feeling confused or angry. 10. Be sure that you only change compensation based on areas agents can control. Instituting a new compensation agreement is one of the great emotional challenges for call center management. Management must create a new compensation plan once, and it must be very good: one that can last for the short term, and for the long term. Management must make a strong effort to consider the emotions of their agents in creating the new agreement. A compensation plan is not only a set of numbers that determine pay. It is an emotional pact between management and agent that shapes a culture, identifies the values of a corporation, builds relationships, and constructs the foundation for the future success of the call center. Create A Plan That Works For The Agents. Perhaps management forgets that they need to develop a compensation plan that works for the call center while also creating a plan that works for the agents. Management may understand they need to look out for their agents. But realistically, they are in management to incorporate the best plan as a whole, and agents can very often come out on the short end of the stick. On the other hand, agents see one point of view regarding compensation plans — theirs! Be Prepared For All Scenarios. Management has a multitude of scenarios they must take into account. If the compensation plan doesn’t motivate agents to do well, the company suffers and the plan becomes an albatross. The entire environment becomes one of complaints, bickering, and attrition. Emotions rage because management has tinkered with the agents’ most prized possession. If the compensation plan compensates agents too well, the company can also suffer, and the plan becomes an “agent vs. management” issue. All of a sudden, management is paying above budget for performance, and bottom lines become affected. Management then takes steps to correct their first error, and raging emotions become prevalent again. It’s the liquid paper. Many, many moons before the fish came the liquid paper. The same California manager that motivated his agents with an “It’s the fish” theme soon became the liquid paper manager, delivering items of use to hundreds of agents citywide. As he moved over the years from one call center to the next, liquid paper became his staple. Here is his story. One evening while managing a survey processing account, management was in need of motivation for their agents. The diligent manager’s company wouldn’t give him a budget to buy prizes, and that was a sore spot. Anything he wanted to do had to be done in-house, with his existing tools. Well, at first glance, one wonders what they have “in-house” to make things happen. Chairs, desks, file cabinets, telephones. None of that can be classified as prizes, unless one wants to take the risk of being arrested for theft. But his agents needed inspiration. The group had long faces and bored glazes in their eyes. Not a single soul was making money. Learn to Work With What You’ve Got. So, the manager grabbed a key to the supply cabinet and ripped it open. At this point, he was looking for any prize that came in multiples. The liquid paper box was a natural. It came eight to ten in a box. He had his prizes. The manager said to himself, “If my company won’t give me a budget to motivate my agents, then my company was going to get a purchase order for liquid paper supplies like they had never seen before.” Deep down, he knew the sales resulting from his motivational efforts would pay for the liquid paper and then some, of course. Get Zany And Rev Up The Mood For Dramatic Results! The whole floor was enjoying the manager’s presentation, and the goal had been established. Each agent absolutely enjoyed the break from monotony. Some even gave the liquid paper a quick whiff. Others painted their nails. Others held onto it and rubbed it for good luck. As the hour came to a close, surveys were being completed rapidly: 100% gain from last hour, 200% gain from last hour. The numbers were soaring. Needless to say, everyone met their goal for the hour, and liquid paper became a favorite for the entire call center. Best of all, the manager got a budget from his boss and was able to buy multiple brands, colors and styles of liquid paper. Motivating with Prizes – Recap! 1. Prizes can be a great motivational factor for those long, humdrum days. 2. You needn’t spend a lot of money on a great prize. 3. Themes can make the workday zip right by. 4. When you work for your team, your team works for you. 5. Don’t let long faces and frowns linger – motivate, motivate, motivate! 6. Just because it’s “not in the budget” doesn’t mean you can’t reward employees. 7. Look around and learn to work with what you’ve got. 8. Don’t be afraid to get a bit zany! Your agents will appreciate your sense of humor. 9. Your antics may create inside jokes for months and years to come, which, in turn, will establish a sense of uniqueness within the workplace and a team identity. 10. Recognize the link between creativity and productivity. If the call center consisted of robots and computers, emotions wouldn’t play any factor. As much as managing robots and computers would make the life of a supervisor much simpler, it doesn’t happen that way. Unfortunately, robots are not very friendly, personable or persuasive. Rarely could a robot make a sale. Only a human agent can successfully reach out and appeal to a customer’s emotions with their genuine enthusiasm and perceptiveness. So as it turns out, people manage people — and emotions are the barometer that sets the table. Emotions impact everything in the call center. 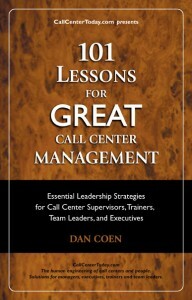 The call center, to function in a superior way, must be understood first as an emotional medium. Perhaps you have peers around you today who see the call center as a statistical world, a business world, and a production or service world. Those folks miss the boat. You need to show them why. Those folks try to hold their agents to textbook standards, even if it means ignoring every aspect of human emotions. Those folks haven’t understood how superior communication culture in any industry, from sports to sales to member service, makes operations thrive. They don’t see why sports teams win fifteen games in a row, and why sports teams lose fifteen games in a row. They don’t recognize how truly emotional the world of the call center is for the participants who are responsible to ensure the call center expands and breaks performance goals. We can take an example from professional athletics to understand how emotions challenge and impact communication culture in the call center. In professional athletics, emotions encompass a huge part of the playing experience. Players channel their positive emotions to give them second efforts on the court. When a basketball team scores 12 straight points and they are on a roll, they continue to channel their emotions forward because of their adrenaline. The crowd keeps them pumped up. They feel good. Their head coach implores them to keep pushing, keep winning, keep trying, and players take the encouragement most readily because they are winning. Similarly, the call center dynamic is affected by environment as well. Engaged consumers motivate the agents, as does coworkers with positive attitudes and managers with positive feedback. And let’s not forget: nothing beats the adrenaline of a successful sales call! Make no mistake about the fact that having proven management, guidelines, policies, and a successful track record can make all the difference in the effort to retain contact center agents. Consistency is extremely important. New contact centers that begin their operations correctly can display a proven track record through the people who relish their jobs. Veteran contact centers that have never done their job right may never be able to show their employees a proven track record, regardless of years spent trying. This lack of consistency and success stands out when new agents apply for positions. Often times those agents that accept contact center work need flexibility, and those contact centers that provide flexibility come off as big winners. Agents typically are like any other people—they want to grow, mature and prosper as well. The contact center that blends all of this comes out ahead. So, what are ways to involve your agents in your call center? Create a series of committees or teams on different elements of your contact center. These may include the culture team; ongoing training team; compensation assessment team; quality scores team; etc. etc. Get involvement from groups, either volunteer groups or those selected by their peers. Encourage a very innovative communication process for suggestions or to placate concerns. Try to have quarterly ALL meetings and more regular mini-meetings. And, use web-forms and anonymous email addresses for agents to voice ideas. Even the traditional SUGGESTION BOX is spectacular because it provides the forum, whether used or not. Use focus groups and round-tables to dig deeper. Invite selected agents to meet and talk. Give them the forum. It is important to remember that tone, pace, inflection and melody work as well with one another as without, depending on situational use. Although these four elements are commonly tossed together as if they were one complete package, it is mandatory that TSRs use each element to its maximum potential. For example, some people may be awful when it comes to portraying wonderful melody over the telephone, but are outstanding at presenting tone and inflection. So, while attempting to sell the complete package, these people should concentrate on how their tone and inflection sounds over the phone. For example, suppose the owner of a dog sits down next to the dog and says in his most trusting and friendly and loving tone: “You are the ugliest and most stupid dog, and I hate you very much.” The words spoken are horrible: they are the “What” of the presentation. If the dog were to respond to the words alone, the dog would be put in a sad and disapproving state. The dog would be unhappy with its owner. However, the tone in which the words are presented is a trusting and friendly and loving tone. These words are the “How” of the presentation. What will the dog’s reaction be? The dog will love the owner’s sentence. The dog will respond positively to the sentence. The dog will probably jump up and down, lick the owner’s face, and ask for more. This example illustrates the importance of tone in a telephone sales call. “How” a sentence is delivered makes all of the difference in the way that sentence is received. Bosses who have successfully terminated relationships with employees base much of their successful handling of such events on “how” they deliver the poor news. TSRs have a golden opportunity to complete many more telephone sales calls by dynamically mastering the tone in which they present their product. Two sentences, delivered verbatim word-by-word, but presented in different tones, will generally receive different responses from the customer. Another reason professors are dull is because they, as repeaters of the same subject class after class, week after week, month after month, and year after year, have lost the pizzazz to deliver successful lectures. Although the students are hearing a particular lecture for the first time, professors transfer their boredom to the students in quite the same way the students project their boredom onto their professors. Clearly, the jobs of TSRs and professors, in these instances, are analogous. TSRs can fall upon the trap of complacency and forget that each customer is hearing the presentation for the very first time. TSRs oftentimes can’t comprehend why a customer doesn’t understand a point, only to realize that the customer hasn’t heard this point as strongly and persuasively as the last customer heard it. Conversely, customers can become quickly indifferent to the subject matter the TSR is delivering, and may project this indifference upon the TSR, although the TSR has had little or no opportunity to rescue the presentation. In order to keep the above situations from occurring and to increase the odds of successful telephone sales presentations, TSRs must pay close attention to Tone, Pace, Inflection and Melody at the right moments and in the correct ways. Presentations that might not be moving in the desired direction often turn around completely with proper use of tone, pace, inflection and melody. Finally, sentences will become more defined, clearer, and make more of an impact on the customer.